Finally getting a Black Dragon shoulderpad sculpted, a mold made of it and then casted was a big accomplishment for me. Taking that shoulderpad and building a model around it was a fun challenge and a great way to put a few techniques I've been working on to the test. This guy fits how I imagine the Black Dragons looking. You're not quite sure if he's a loyalist or traitor by looks alone. He certainly doesn't fit the profile of a good guy. Before I built him, I knew I was going to incorporate the Dragon Claw idea on him. There was no was I was going to skip out on that little bit of fluff. Of course it meant finding a suitable arm and adding some "spikey things" to represent the blades. I think I pulled it off. The only other thing I stole from the Index Astartes artwork were the little Dragon type wings he has attached to the sides of his knee pads. At least that's what they look like to me. I opted to leave the primitive weapon in his hand and not replace it with a chainsword or power weapon. It fit with the ruined basing and the skulls I added to his waistline. Kind of gives him a headhunter look I think. Fitting for a Veteran Sergeant I imagine. The armour is the P3 Coal Black technique I'm working on. Keeping with the zenithal approach, I only hit the upper portions of the armour to give it a tiny bit of color. The majority of the model is black. The weathering is where I really worked on this guy. I used a metallic weathering powder to dull down a few spots on him that would see a good bit of wear and tear. I followed that up with a pencil application to his more prominent armour plate edges. 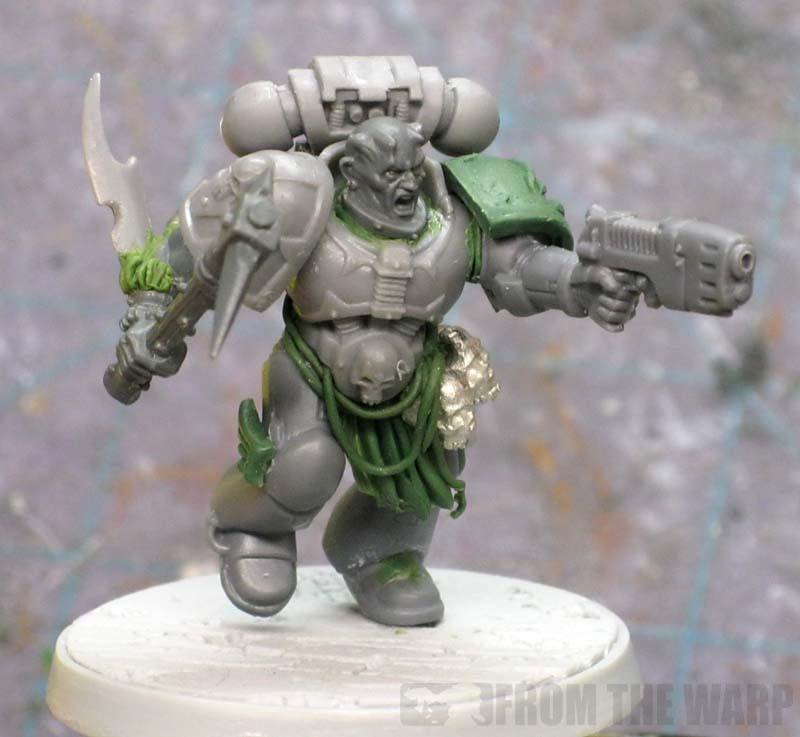 The skulls on his waist and the base come from Secret Weapon Miniatures. The little bag-o-skulls make it so easy to add things like this. I just wish they were resin and not metal, but having a ton of them handy makes it worthwhile. I just hate working with metal. The base turned out a bit darker than I would have liked, but it's alright. I like the little bits of grass and leaves I added to it for some color. I need to work on my leaves though. They aren't the best. I think the one part I like the most are his Dragon Claws coming out of his arm. After reading the background on them, I had no idea how I was going to paint them. I decided I'd try the metallic weathering powder I had to make them look like they were Adamantium like it says they are in the text. I think it turned fairly well. If that hadn't worked, I'm not sure how I would have painted them. All in all, I like this guy. I think he turned out alright. My favorite part is the weathering effect achieved by combining the metallic weathering powder and the pencil. It gives you the worn down look and the bare metal edges together at the same time. That and my press mold Black Dragon shoulderpad doesn't look half bad either. At first glance, you wouldn't even know I made it. That's the best judge I suspect. If you don't recognize the conversion in the first place. I have to say that while you are a great painter, your talent runs deeper than simply pigment and brush. I feel as though you accurately capture the 40k "ethos" time and time again. While John Blanche is or was arguably the creative force at GW in terms of illustration, GW would benefit from having you develop "concept pieces." Thank you for all the inspiration, You are an asset to the community. Your work is always amazing and well done. To me, this is a very subtle conversion, even though you have done a lot of work to it. It just looks and feels right. I just have to agree 100% with the above posters. I'm loving the weathering on this Black Dragon. It's subtle and precise, not overdone. Looks awesome! The only thing I'd change is to put a hole in one of the skulls about the same diameter as the primitive weapon spike he is carrying. The skulls being metal would make that a pain though. 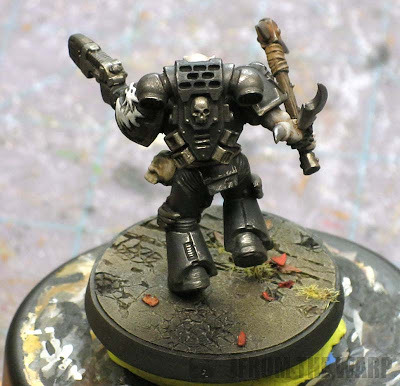 Not sure I like the metallic blade bits, hard to envision that growing out of his arm as he completes becoming a space marine. A bone colour would've been more apropos in my opinion. Little wings look great, the shoulderpad came out well and I like that you left the pick as his weapon! That's yet again a serious endorsement for the Metallic Weathering Powder from Secret Weapon in my opinion. The judicious use looks great and you really pulled off a great look on the figure, Ron. I've also got to agree with you in that the best conversions are often the ones you can't tell are conversions. Looks like I've got a few things to add to my Christmas list for the wife in the form of a few things from Secret Weapon! Looks terrific! The shoulder pad came out great and the model really feels solid all around. For what its worth, I honestly wouldn't be able to tell the difference between a molded shoulder piece and a regular one. Looks really good! Thank you guys. I didn't think this guy would get this kind of response. I figured he might get a couple "good job" comments, but I didn't think he would hit the mark like this. I think if I can refine the technique a bit more, I'll be using it to paint my Deathwing in a black scheme. The Inner Geek: What a good idea! That's one of those little things that can be forgotten as you work on a model and become accustomed to seeing it in front of you for long periods of time. Tristan: I was at a loss for what "color" to make them. The background info mentions them being adamantium so I figured that was as good a place to start as any other. 1. I've got a great working relationship with misterjustin both in terms of professional help and products. 2. The stuff I do get my hands on from him are worth it for me to buy and use. I don't use everything, but the stuff I do use has served me very well. As with everything I use, I keep the good stuff and drop the rest and make sure to tell you guys about my experiences regardless of where or who the stuff comes from. Every time you make a post that shows some of your sculpting work I'm blown completely away. Having tried on many occasions to create my own chapter symbol to go on shoulder pads I have the utmost respect for the quality and detail you're able to achieve on such a small scale. Grishnaar: Absolutely. It's one of those small things that can be really helpful in certain cases. It's not something I'll do all the time, but it's definitely nice to have the ability to do it. Very nice work. 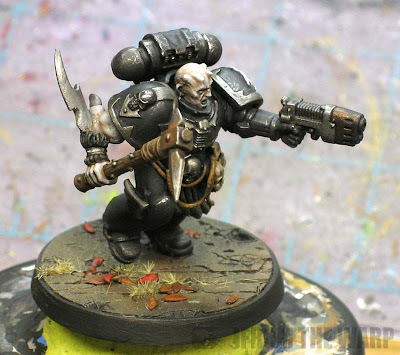 I had a question about the weathering powders: do you add a little water or just brush them on dry? If dry, how do you fix them? I have not had great luck keeping the FW ones on without water (not tried Secret Weapon yet, although I'm tempted by the metallic one). My method so far has been to add a bit of water, paint on, and then spray varnish (Testor's Dullcoat). Anon: Good question. I just brush them on dry. I have had some luck with setting them in place with alcohol. Varnishing them gives me nothing but trouble. I have a post going up this coming Monday morning about my results of varnish and alcohol over powders. Thank you; I look forward to it! Hi Ron I found that womens hair spray good to hold the powders in place. 1. Does it affect the look of the powders? 2. How does varnish do applied over it? First I absolutely love how this came out! 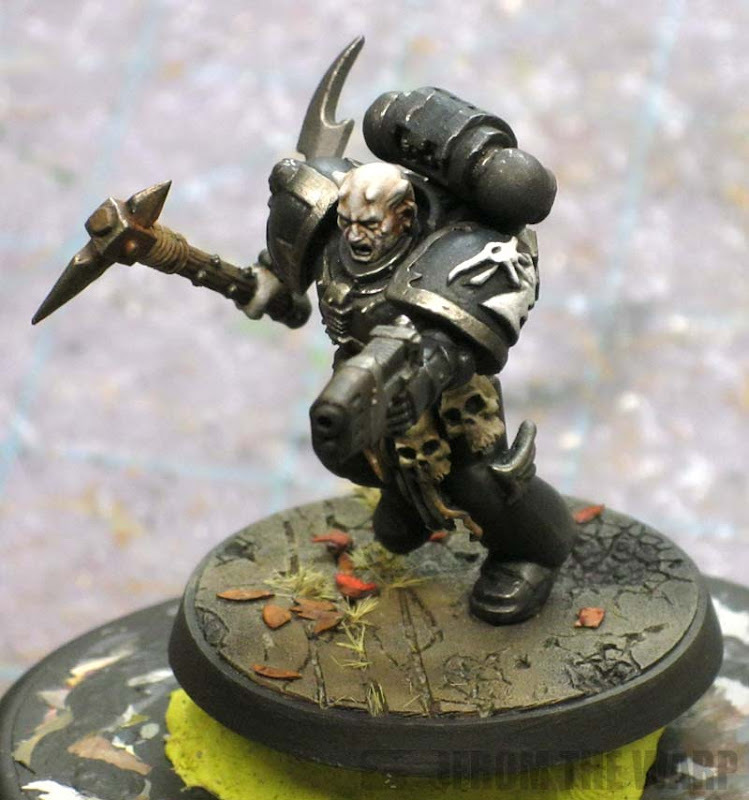 I will definitely be using this technique for my Black Legion. what is your recipe for the silver banding? Is it the same as your recipe for painting Necrons? Kevin: Kinda. If you're talking about the trim on his shoulderpads, it's a base of GW Boltgun Metal followed by a wash of Badab Black. A little bit of Devlan Mud in some places to simulate grime. Then it's pencil to the edges of it to create the highlights. Hi Ron to answer you questions. Yes but only a fraction. Be careful of what hairspray you use. Look for one's that don't offer a gloss look to your hair. How does varnish do applied over it? Never tried it. As I never vanish any minitures I paint as they can kill all the highlights. Well Gw varnish does. Evay metal painter don't varnish as well. Anon: Excellent, thanks for the help! I'm going to have to try it myself and see what I can come up with.